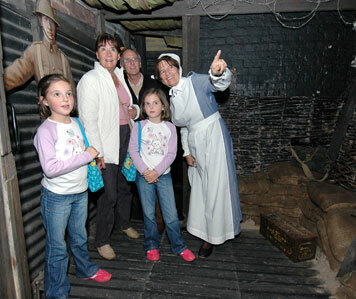 This reconstructed walk-through display trench gives some sense of what it was like on the Western Front. Use it as your way into the Regimental Museum from the Castle. Complicated systems of communication and holding trenches were dug behind the front line trenches. Attacks were not made from these but they enabled troops to be reinforced and relieved. Also essential supplies of food, ammunition and medical equipment were stored and moved in the great network of communication trenches. Although not on the front line the constant sound of gunfire would be heard and there were still risks from gas carried by the wind. The lack of drainage meant that in heavy rain all trenches quickly became very muddy. They were also infested with rats.